NB! 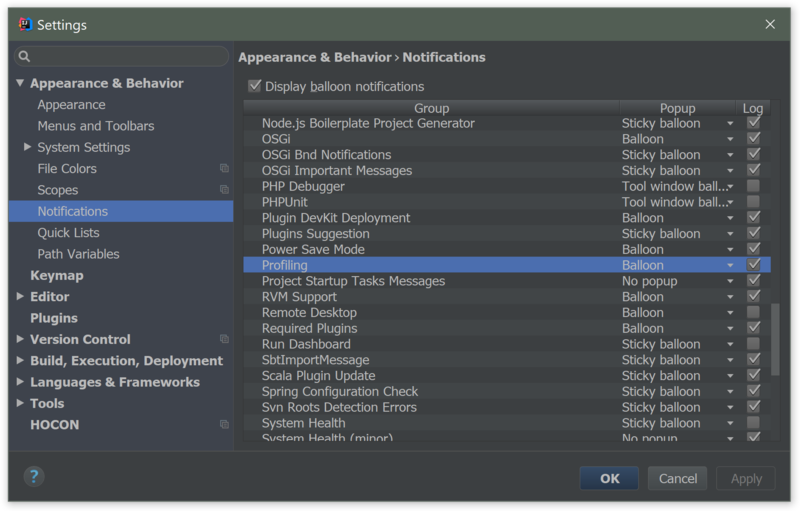 This article covers only Java Rider process (JetBrains Rider). For .NET process (JetBrains.ReSharper.Host) related issues refer to this article. Please collect TreadDumps from Rider logs folder for reporting the problems when IDE is completely frozen and doesn't respond to any actions for a long time. A dump should be taken exactly at the moment when IDE doesn't respond and record the thread stack. If you can continue working with the IDE, but it feels slower than expected, CPU usage is high or there is a memory leak, read below. After restarting the IDE you should see two new items under the Tools menu: Start CPU Usage Profiling and Capture Memory Snapshot. To provide an informative CPU snapshot you should click on Start CPU Usage Profiling and then perform the actions which are causing performance problems, try to reproduce the performance problem several times while the snapshot is being recorded, then click on the Tools | Stop CPU Usage Profiling to save the snapshot file (snapshot is saved in the user home directory and IDE will show a notification with the exact file name, the extension of the file is .zip). If you don't see a notification and can't find the snapshot file, please check that notifications are enabled for the Profiler. When reporting the problem, please make sure to describe what you were doing in detail. Make sure there is no disabletracing option in the -agentlib... line, use the options string from the Enabling Profiling Agent section of this document. Restart your IDE and capture the CPU snapshot from the Tools menu or using the toolbar button. option to change it. See Oracle documentation for more details. Please note, that memory snapshot may contain the sensitive source code from your project. Adjust this line depending on the OS. Please check the Enabling Profiler Agent section above. You just need to replace delay=10000 option with the sampling option and make sure NOT to specify the probe_disable=* option. CPU snapshot file will be saved automatically into your HOME directory with the .snapshot extension after your close the IDE. After you've saved the snapshot, please upload it to our FTP server: ftp://ftp.intellij.net/.uploads/ (anonymous login, .uploads directory has no permissions to list/download files, only for upload, so that other users will not be able to download your snapshots). Inform JetBrains developers via YouTrack performance problem report about the uploaded file and provide its name (or send this file name to the Support Team via the ticket). If you can't use FTP, upload the snapshot at https://uploads.services.jetbrains.com/ or use some file sharing service, like Dropbox, Google Drive, etc. and send us the link. Please see Uploading Large Files for JetBrains Support Team for more details.